Last Spring I shared with our students the idea of having lunch with myself in our school library. I wanted to have lunch with five or six students per day, Monday, Wednesday and Friday. The invitation was shared with our teachers in the Week at a Glance memo on Monday morning and with our students via our morning announcements. There would be a sign up sheet outside the office if students wished to sign up. Students were quite excited about the idea and many students signed up. There was much anticipation about having lunch in the library and the younger students in grades 1, 2, and 3 were quite curious about which day or date would be their day! For some students, the day could not come soon enough and they asked daily when it would be their turn. On the first day we had our lunch together, we had five students. We gathered and began to eat and chat. I asked each student what they were learning in their classrooms and each was quite excited to share. As the students spoke, it was easy to see the enjoyment they felt about having lunch in a small, quiet space. But the greatest benefit that I noticed was the connection they felt to one another and to me, the school principal. Time passed swiftly in our 25 minutes of eating time and when asked if they enjoyed their lunch…there was a resounding “Yes!” from all students. When asked what they enjoyed the most, they said it was so fun to talk and liked how much quieter it was having lunch in the library. It was interesting to see everyone taking turns and listening while their peers shared their thoughts and ideas about school, home and friendships. It is very satisfying to observe how students really are tuned into what is happening in their classrooms and the learning that is taking place. Getting to know the students in any school takes time. As principal, I try to connect with students in a variety of ways. I connect with students in their classrooms, in the hallways, on the playground, during lunch and, of course in the office, too. Connecting with students across many areas is important when building a relationship of trust and respect. Taking the time to connect with our students benefits all of us. It makes for a positive school climate and culture. The results we see are: happier kids, happier teachers, and kids who feel like they are a part of something. We all want to feel like we are part of something! Having lunch with the principal will begin again in November and I, for one, look forward to this time with students. As I reflect upon the highlights of last year, I had one experience that has stuck with me and sums up why we need to connect. After everyone had packed up and headed outside to play, one little guy remained. He was taking his time, packing up his lunch bag. Earlier, during lunch, I noticed that he kept checking his lunch bag for something. As he was opening the bag to put his lunch containers away, I noticed a note neatly tucked in the pocket on the inside cover. I asked him about it. He read the note aloud to me. “Hi Little Man. Hope you are having a good day. 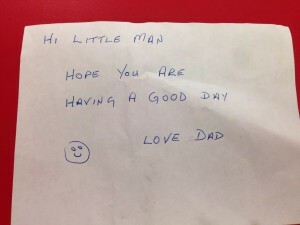 Love Dad.” He then placed it carefully back into his lunch bag. 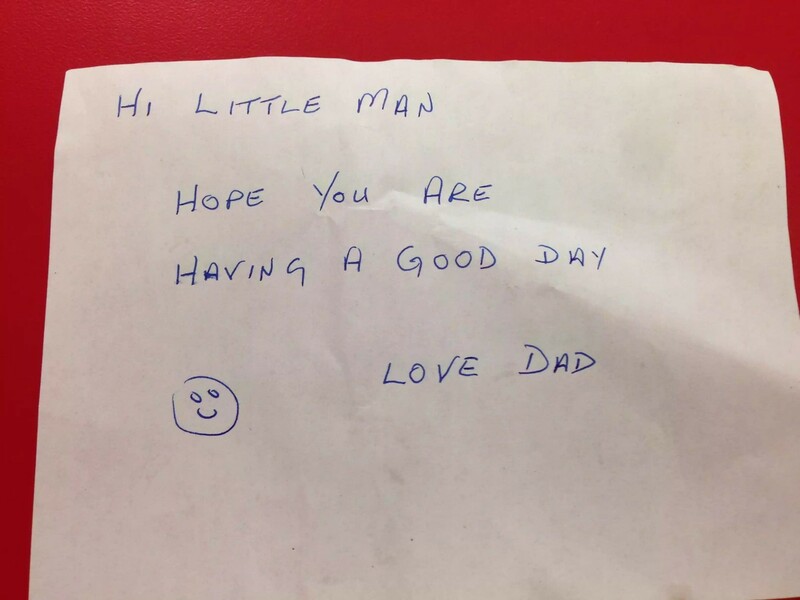 Clearly, this note meant something very special to him…this was his connection to his dad during his day at school. It was a powerful moment. Sometimes we are not aware of the power connections can make. Taking the time to make that connection with that one child can have a profound effect not only on that child, but also on us adults, too. How are you making connections with the students at your school? I would love to hear your story.